First-years pose outside Widener for the 2020 Class photo. 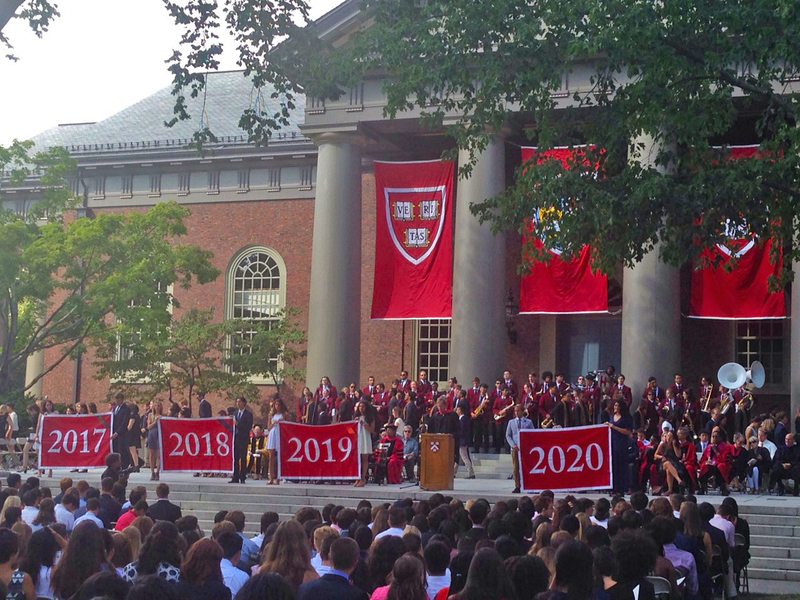 Harvard Alumni Assocation President Martin J. Grasso '78 presents the Class of 2020 banner. Each new Harvard class will gather together on just two occasions before they graduate—once during Commencement week, at President Drew Faust’s baccalaureate address; and at Freshman Convocation, for which the Class of 2020 gathered on a mercifully cool August afternoon. Faust and College dean Rakesh Khurana remind freshmen each year that they’re experts at succeeding—“Once again, I’ve been reminded why I didn’t get into Harvard,” Khurana said—and yet Harvard is also a time to unlearn what it means to be successful, to embrace and understand the humility, risk-taking, and generosity that drive intellectual progress. President Drew Faust delivers the Convocation address. Emma Woo ’17, who delivered the traditional speech from a member of the senior class, offered a similar idea: It is tempting, she said, to go through Harvard with the aim of eliding distinctions among peers, avoiding conversations that might make others uncomfortable and challenge students’ own sense of self. She recalled a tense disagreement with a friend about religion, which for Woo always had been a source of strength and beauty: “We both had to reevaluate our assumptions and judgments of the other’s statements and learn how to feel unsettled with our opinions. It meant reevaluating our narratives to no longer be just tools to find similarities with one another, but instead also markers of uniqueness that we could share,” she stressed. “This was a moment of realization for me: within all the common ground I was finding with people around me, I had assumed that engaging with difference was less important to my personal growth than embracing similarity, and I was starting to realize that I was wrong.” The experience moved her to join the Interfaith Forum (which she now leads) and engage with other faith traditions, and, crucially, to make calling out difference central to her life. 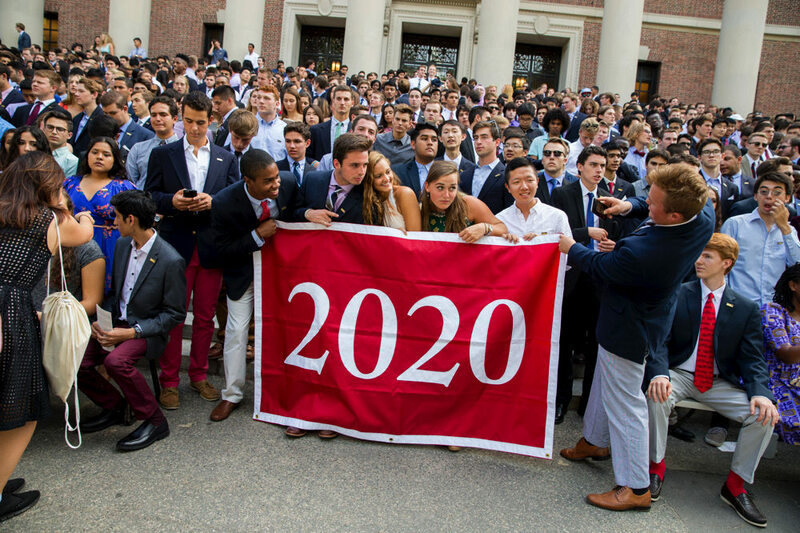 Martin J. Grasso ’78, president of the Harvard Alumni Association, then presented the Class of 2020’s crimson banner, which was followed by a rendition of “Fair Harvard” and a recessional sending the first-years to gather for their class photo on the steps of Widener.